Gail Olivia White-Everett welcomes you to Olivia’s Wellness Connection at the Y. Gail started her mission-driven organization in order to “spread the gospel of Wellness by motivating and educating people from all walks of life, and to make their health a priority in their lives.” She is delighted to partner with the YMCA to spread the word and expand participation in her program. Having founded OWC in memory of her late mother who passed away much too early in her life, Gail feels strongly that if she can convince one person to live a healthy lifestyle, her mother’s death will not have been in vain. A great motivator and your personal cheerleader, Gail will make sure that you feel supported and cared for in your efforts to achieve your wellness goals. She will work with you to learn the basics of healthy eating, exercise regimens, and how to stay on track. Gail has an associate degree in exercise science and certifications in life/wellness coaching, weight management, personal training, Pilates, pre/post natal, older adults, aerobics and bender ball. New Year Healthier New You 90 day challenge — Beginning January 5th and ending March 31st, 2019. MVP Workout — A great workout! Exercise program that immediately precedes the Health is Your Wealth Wellness Workshop. Saturdays, 8am in the Group Exercise Room. “Health is Your Wealth” Wellness Workshops — Weekly meetings offering weight and blood pressure check, food journal, healthy snack, nutrition education, and healthy cooking instructions. Each week also has a special theme for a new area of learning. Saturday Mornings, 9am workshop in the Lower Conference Room. 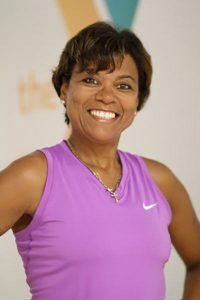 Gail believes deeply that “your health is your wealth” and wants to work with you to find your path to a healthy lifestyle. PLEASE NOTE: Before starting any new program you should consult your doctor first. The workouts are low impact and you work at your own level. Remember: Healthy Eating + Regular Exercise = A Longer Lifespan!